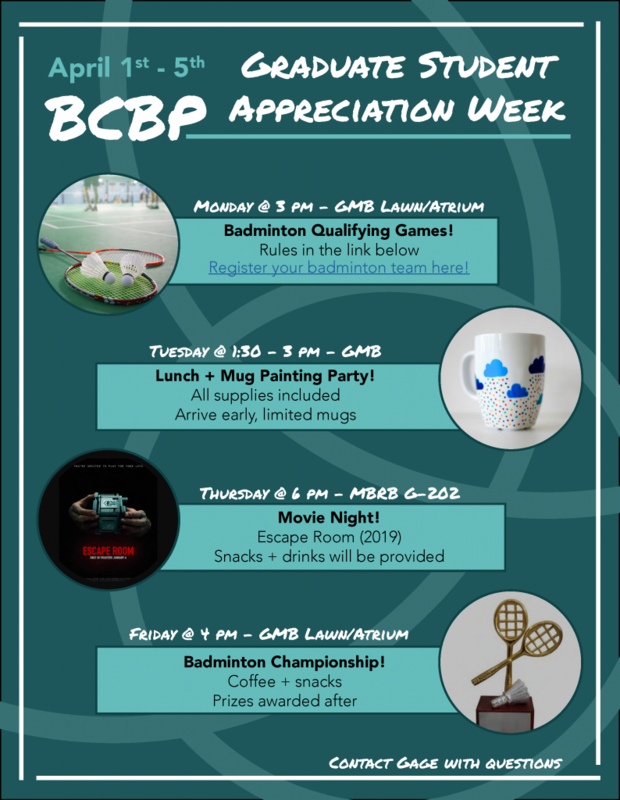 Grads, faculty, postdocs and staff are welcome to compete for your pick of prizes after Fridays Badminton Championship! Please register your teams here. If you need a little energy before/after your game or for those just watching; coffee/snacks will be provided! Students that have FYG on Mondays can still compete in the Friday games, just contact me! Join your fellow graduate students for lunch and mug painting! Lunch is catered through Med Deli and if you are curious on the painting process or want a few design ideas this website is a good start. Painted mugs will be returned Friday, April 5th. If you like thrilling movies we are showing the movie “Escape Room”, provided through CUAB! Snacks and drinks are being provided by several departments so we are sure to hit your sweet tooth or popcorn fix. Come get free ice cream from the JAMS ice cream truck in the usual GMB food truck spot! We will provide free tickets at a location TBD. Contact: Gage Leighton for more information. Teams that made it through the qualifying round will be able to compete for their chance at first, second, or third pick of UNC merchandise! As usual coffee and snacks will be provided!